An underground lair modelled on an exclusive nightclub lies below this riverside bachelor pad near Ghent, where the owner has built-in cigar and wine storage, a car lift and a view into the depths of the pool. Belgian studio Govaert & Vanhoutte Architects designed the residence for a single man in his forties on a plot beside the Leie river in Sint-Martens-Latem, just southeast of Ghent. Planes of concrete fold around a pool in the centre of the plot to form the residence. Daytime spaces are placed around its edge at ground level, with large glazed facades allowing the owner to appreciate views of the pool and river. A pool house with timber siding sits to one side of the primary living spaces, and extendable shutters can be drawn across the gap between to block views from passing boaters. 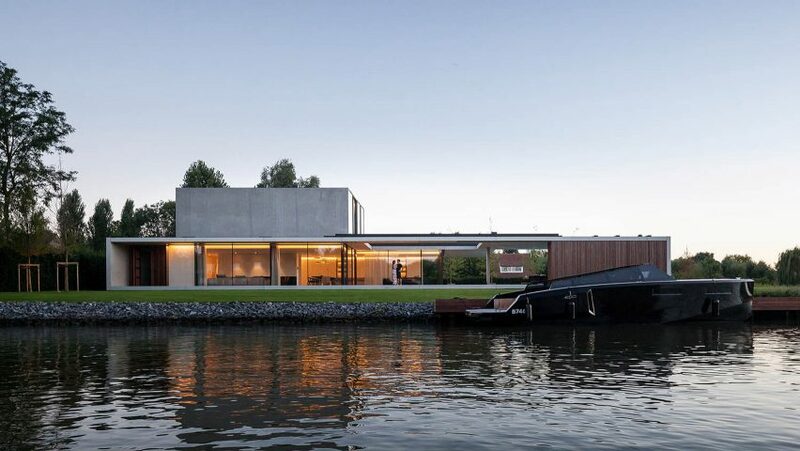 "Many boats reduce throttle or come to a full stop to gaze upon a residence, quite different from the other houses along the river,"said Benny Govaert and Damiaan Vanhoutte, who named the project Residence VDB. "Amidst a golf terrain-like garden lies a sculptural concrete bachelor pad, grafted on the lifestyle of its owner." "The view from the river shows a long floating horizontal concrete framework that defines the ground floor, inside as well as outside," they explained. Perched above, a smaller concrete block contains a master suite, and two further bedrooms and bathrooms. A roof terrace adjoining the master bedroom has a sunken floor, creating privacy for the owner while giving him views down into the garden. These spaces are kept brightly lit by ample glazing, white walls and neutral-toned furniture, but downstairs the architects have created a more moody environment. Black plaster walls, dark woodwork and subdued lighting create a club-like atmosphere. Wine bottles and cigars set behind floor-to-ceiling glazing line wall of the space, while an integrated sofa runs, bar and DJ booth flank a central seating area. 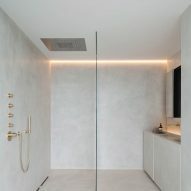 A car lift allows the owner to lower one of his exclusive sports cars into a display area at one space, and behind the bar, a huge window faces into the depths of the swimming pool. 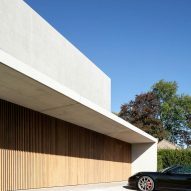 Geneva studio B29 designed a similar "James Bond super garage" for a royal client in Switzerland. "Nightly activities reside underground," said the architects. "Descending the stairs along the glazed front facade, the bright ground floor becomes dark and cosy in the cave." "The bar behind the pool window, a DJ booth, a glazed wine cabinet, the long lounge benches, the area for exclusive cars, a built in cigar cabinet, are the embodiment of an exclusive underground club." Govaert & Vanhoutte Architects have previously a house with fence-like walls and a glazed living space for estate agents in the Belgian village Knokke and another in the forests surrounding Bruges featuring entirely glazed walls and a sunken pool.